During our afternoon shark cage diving trip you will be able to see the Sharks from a point blank range and the best part is that this trip revolve around shark cage diving. No diving experience is necessary. We do offer shark diving ALL year around. Shark species can include Sevengill Broadnose cow sharks, Great white sharks and the odd Bronzie or Copper Shark. (Mako Sharks & Blue sharks on Pelagic Trips). 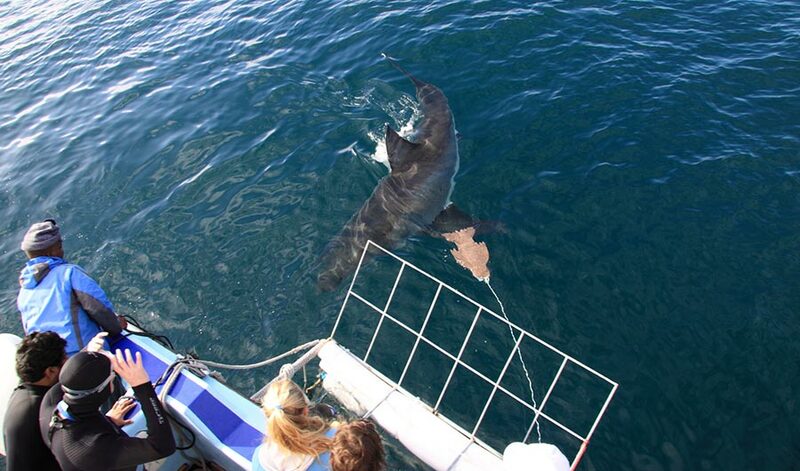 Shark Cage Diving is one of the main reasons that people come to Cape Town. And shark cage diving is what we offer! Book with us in False Bay. 11h30 at our shop in Simons Town. Our trips run from Simons Town, which is only 45 minutes from Cape Town. For the afternoon shark cage diving we chose to only take small groups boat so you can enjoy a comfortable trip in a more personal and exclusive environment. No Scuba qualifications are necessary! The cage floats just under the surface of the water, and it is situated alongside the boat. Only 5-6 enter the cage at a time, all scuba equipment stays on board and only the scuba hose enters the cage, allowing you to enjoy a great dive without cumbersome, heavy tanks and gear. The average dive time is 20 minutes depending on the shark activity. Once everyone has had a go, and if there is enough time, then a second dive is allowed. Our crew is highly trained and safety is of utmost importance. Departure 13.00 PM. Departure to Seal Island False Bay. This is a 25 min boat ride. The cage is lowered into the water and secured alongside the boat. A bait line is put in the water as well as the carpet seal decoy. These are used as attractants for the sharks. They are surface feeders and are very curious animals. Please note that the aim is not to feed sharks. We are NOT an adrenalin outfit and we do not touch sharks. If you do not wish to dive, you will still have excellent views of the Great White Shark as we have a lovely viewing deck on the boat. 16.00 PM Return to Simons Town. Coffee Vouchers and a dive certificate will be handed out.